You are here: Home / Real Estate News / Are Laneway Houses the Answer to Canada’s Housing Crunch? Are Laneway Houses the Answer to Canada’s Housing Crunch? Anyone who lives in Canada’s booming urban centres—Vancouver and Toronto, especially—know there is no more room for anything but skyscraping condos in the vast downtown areas. Save forever and push for a raise at work. However, there may be a third option where you wouldn’t think to look. In most large cities, there are laneways behind houses, to provide parking and access to garages. These lanes are typically unnamed, but frequent downtown cores without most ever travelling down one. In the last few years, houses have begun to spring up on these back alleys. Appropriately named “laneway houses,” these structures are normally small, tall, and pretty damn cool. They can use the existing garage structure as a base, or may be new buildings entirely. Because they’re restricted in how much space they have to work with, laneway houses are the best of modern, confined living—think tiny houses, but three storeys and a bit more leeway. They sometimes mirror Dutch architecture: tall, concise, and efficient. And because their size is limited, the building costs can be less than your average freehold build. So, if everything sounds great, why aren’t there more laneway houses? Long-story-short: building one of these guys is extremely tricky. Cities like Toronto seem to discourage building these, due to regulations and other problems. Vancouver, on the other hand, has a guide on how to get started building your laneway house, as they’ve embraced laneway houses as a way to squish more homes into a “full” downtown. Let me walk you through some of the problems that could arise. Laneway houses can only be built on properties of certain sizes. In Vancouver real estate, for example, laneway houses can be built on lots 32 feet wide or wider in a residential single family zone. Toronto bylaws prevent two separate residential buildings existing on the same lot, so properties have to be split. Dividing lots can be costly and timely, and may still result in getting declined by the city, depending on the circumstances. Because laneways aren’t considered legitimate streets, gnabbing an address is easier said than done. Builder Brandon Donnelly documented his attempt to build a laneway house in Corsa Italia, Toronto and notes that “it’s next to impossible to get a laneway house built in Toronto.” Donnelly tries everything to get that address, including extending the lot alongside the street-facing house to get a house number. But that then limits the parking space for the original house, and zoning bylaws require each house have at least one spot. And speaking of parking, don’t forget that even your laneway house would need a parking spot. 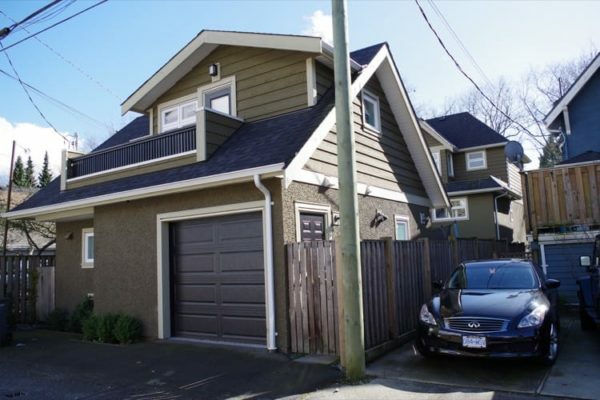 Most laneway houses are so small because they include a parking spot directly beside the structure. Others have a garage or covered parking spot as part of the structure, taking up much of the first floor. While garages are covered under the home insurance of the main structure, laneway homes need separate insurance. Providers are now assessing what level of insurance is appropriate, as the houses cost less, but are more valuable than a garage, and have special needs. Getting water and city services to your laneway house can be the most problematic, and is what limits most from being built. If you’re able to run water and sanitary services via the main road, it’s a lot less expensive and is less of an obstacle than through the laneway. Some cities also pump the brakes thinking of other necessary city services—fire, police, garbage—and the complications that could occur in the future. Essentially, in order for laneway houses to actually take off (which I think they could), city councils need to have a shift in their thinking. While Vancouver is embracing laneway houses and Toronto is limiting builders, there’s no reason all major cities can’t make a few changes. For example, laneways can have names; there’s no reason they can’t or shouldn’t. This would remove one major roadblock and would snowball into the acceptance of these niche buildings. That said, there will always be problems with having a home on a small alley. You want firefighters to be able to access your home, so do keep these things in mind when exploring laneway house options.